Please click here to return to comment 7 of the main paper. Will China go on growing like it has for the past twenty years? China is going to change politically, but into what? Is there a possibility of a big disruption? These three link together, of course. Big disruptions probably come from and with big change in growth rate, and so on. But I think we can keep separate for discussion. I will put them together a bit at the end. Maybe some commentary helps understand this. After disaster of Mao's reign and the complex, up-and-down struggle for succession, Deng Xiaoping began serious reform of the Chinese economy, privately from 1979 and in public after 1980. The Four Modernizations, - agriculture, industry, technology and the military – began in earnest, aiming to turn China into a middle income country by 2050. Everyone was surprised by what followed. Huge investment – up to half GDP – generated extra-fast growth. 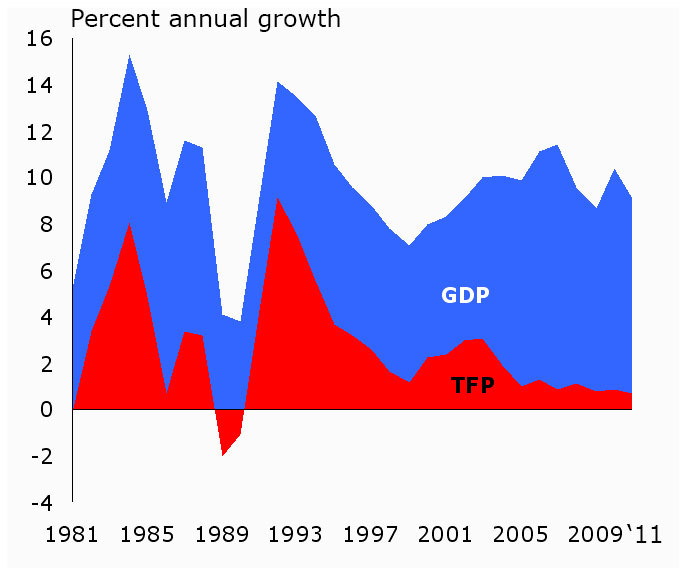 Growth was so fast that in 1989, the government heavily braked the overheating and runaway inflation. Government suddenly cancelled most large investment projects. Then they loosen up and everything grew again. Deng went on world tour in 1992 resulting in much foreign investment, and experience showed that China would deliver to quality, to time. Idea of now outsourcing work to China began to make sense to Western industry. Cities now grew very fast and China had a wave of social change, with open criticism of the state. To slow things, the state took deflationary policies through the 1990s. But still, foreign inflows and a real change in personal ambitions inside China kept fast growth running. Statistics like China having half of all the construction equipment on the planet, or using half of all the aluminium and copper on Earth are probably true. It is real tribute to Chinese government that they managed all this without bad errors. Every city in China has been rebuilt in the last 25 years. That's astounding. They went from sleeping 8 to a room in hutongs to high rise apartments in that time, and not just in first-tier cities. I have tried to find a quaint backwater city with large hutong neighbourhoods. They just do not exist. So some people on the coast got suddenly rich. Also, economy became complex needing banks, lawyers and so on, so service sector began to grow very, very fast after 2000, giving famous double digit growth. Then West's 2007-08 crash occurred. Again, government tried to manage the economy, and printed about US$1.5 trillion to invest, chiefly in fixed infrastructure. This kept growth up, but also led to a property bubble and considerable leakage into corruption. China is now experiencing weaker growth and has for first time for decades a current account deficit. OK, so we see very fast growth that is first driven by reforms, then a mixture of investment, labour and efficiency and more lately, just by investment. Efficiency has dropped to quite low levels. At the same time, government (Party) believes that export-led growth is going to be slow and that China now needs to grow through internal demand. For that to happen, people need to save less and consume more, and wages need to rise. Even in 2005, the Party approved the 11th Five-Year Economic Program which was asked for "harmonious society", through balanced wealth distribution and improved education, medical care, and social security. Now, people save a lot because they used to get no pensions, and because of small families, they had nobody to rely on in the next generation. So pensions and health care, things which are still very rare, are essential if China is to follow this plan. To see how hard this can be, consider pensions. China has moved extremely fast on pensions, from essentially none in 2005 to now 326m people enrolled in rural state pension, today, 300m in the city. That is a great achievement. Payments are in the order of $44 / month. But, China is fast getting old. There are 181m people over 60 today, and there will be 390m in 2035, a quarter of the world's total retired population, by the way. Japan and China will both have 1.8 workers per retiree in 2035. This is true for all wealthy SE Asia: Japan, South Korea, Taiwan, Hong Kong, Singapore, none have a birth rate above 1.4. Surveys say that the big reason to get to the city in China is to escape the extended family, the obligations, the lack of privacy. That is also true of these other countries as well. But the others have high per capita incomes, and China does not, and the "me" generation may have arrived too early. It turns out that many state enterprises have pension obligations that they cannot deliver. All pension assets are earning below inflation rates of return – banks pay a few percent - so promise of 60% of final salary unlikely to be fulfilled. Local authorities are responsible for management of state pensions. Many have often diverted pension funds to other uses. Most has gone Ponzi-wise to current pensions, particularly in the rust, or have been embezzled, spent on consumables or prestige projects with no cash stream. For example, the pensions director in Gansu was sentenced to death for embezzlement. In general, declared assets currently at 270 bn Yuan, but savings paid into accounts have been in excess of 2.5 trn Yuan and the rest has vanished. If is it possible to eliminate corruption and make these services work it will mean a happier country, maybe, it also means lower growth, more expensive products and probably it means that China will itself start outsourcing heavily. That brings it into a reciprocal relationship with much of east Asia and India, which is good for soft power that China has been cultivating. Now, let's get back to our questions. First, we asked if China will go on growing like for the past twenty years? The answer to that is that no, it will not. There are at least four reasons for this. One is that its financial system, if not under the same kind of stress as the West, is still not so happy. It and other factors make the old system – state spending and export led growth – really difficult for the next ten years. Second, its people are getting old, like we have just seen. Third, also as we have seen, it needs to start consuming rather than investing. Household income is 43 percent of GDP, too low to support a higher level of consumption if we believe the World Bank on this. Four, the complexity that China has built is not working well with the party system. From environmental issues to social mobility, from permitting labour movements to the consequences of modern communications technology on the national political voice, China has a great deal to digest. As we have seen, corruption is a major issue, and perceptions of corruption are a second also very important issue when thinking about future politics. Let's look at these one by one. Its financial system has been subjected to thirty years of scrutiny and we still do not understand it. It is not clear that the Chinese state understands it, It changes very fast, too. Best guess is that with local government debt and the cost of re-capitalising state-owned banks – see below – and also bonds issued by state-owned banks and other infrastructure bonds like for railways are included, China's total debt is around three quarters of GDP. That is comparable to many debt-burdened Western countries, if not Greece or Spain. Bad loans probably account for 60% of all the equity of China's banks. Three quarters of the multi-trillion stimulus package came from state owned banks, many provincial, many lending to state owned enterprises. These relationships are widely corrupt. When the project actually exists, it many times purchases through many layers of companies in which parties to the deal have an interest. Often the work is sub-standard - for example, not as much cement in concrete as invoice says, and structure therefore weak. 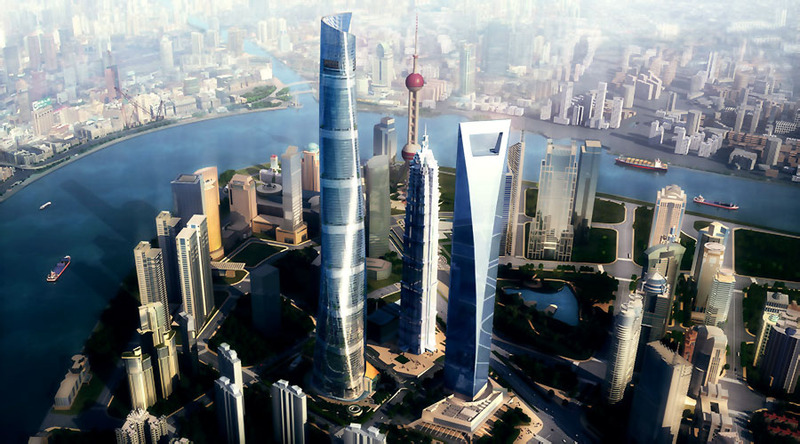 China is supposed to have half the world's construction industry. Everywhere there are empty buildings. There is enough office space to meet needs to 2025 and beyond. This started in early 2000s through private investment. State banks paid savers below inflation rates of return. So they looked for other things to do with the money, and found construction. Then the state started its stimulus program and a lot went into construction, so now many loans based on empty property – classic property boom like say Thailand in 1998. If the weakness in local state owned banks became an issue – just exactly like Caja banks in Spain – the size would dwarf the Japan-type crisis. China can though just print its way out of difficulties, however, but real point is that China may be approaching the limit of state stimulus. That may be a problem during transitional period, if this is not happening quick and efficient. Economy in China has not built a domestic market anywhere near big enough to absorb current production. They can build all the infrastructure they like but with their Soviet internal passport system it does not allow the free movement of capital and individuals within their own country. But it is wise to remember that Chinese government is not for China, it is for the Party, and its objective is not to make profits but to stay in power. How does it stay in power? By keeping "economic growth" high and therefore keeping the people happy. This is a dangerous circle. The Chinese private savings rate is famously high. In fact, most countries which lack a social safety net tend to save a large proportion of household income, against crises and old age. It turns out that Chinese household savings rates are, in fact, very similar to other nations in Asia on broadly similar individual incomes. What causes Chinese savings to appear high is that households receive a smaller fraction of national income - about half - than any other comparable nation; indeed, almost all nations. This is the consequence of long-run state policy. A combination of policies have been adopted - low interest rates, low wage growth, an undervalued currency - which subsidise export-led growth at the expense of the citizens. Local demand (household share) of the goods and services produced by China have fallen from 65-70% of output in the early years of the boom - 1980-90 - to about a half of output today. Savings equate to corporate investment, explaining both high growth rates and the seemingly high savings rate. A switch from export orientation to internal consumption has, therefore, two consequences. One is that household incomes have to rise - via wages, chiefly - and second, that corporate "saving" has to fall. Both of these will slow growth. The hope is that the increased domestic demand will compensate for this, as the change will cause an irrevocable loss of international competitiveness. That brings us to the fourth issue. We have seen that the financial system is at a limit; we know that the population are getting old and that there are big problems with retirement incomes, we have seen that the economic model that worked for thirty years is going to have to change. That brings in fourth point, which is about management and government. I am going to add a related, fifth issues that will slow growth. That is managing the environment. China has neglected environmental protection for the sake of rapid growth. Here, we breath coal smoke every day here from there. But water and air pollution probably cause maybe a million premature deaths every year now just in the coastal region and Beijing World Bank says that 16 of 20 worst polluted the cities in the world are in China. Two thirds to all rain in Guangdong is seriously acid, with farm losses that are guessed at as around $3bn per year. Air pollution has started to shifts in the weather. It now rains 30% less in half of the sources its major rivers, regions which have also suffered extensive deforestation. The country's wheat, rice and corn yields have fallen by 35-40% due to acid rain, over-cropping and low rainfall. The deserts are expanding. The Gobi Desert grows by 5000 square kilometres every year. China has lost farmland to urbanisation that is like about half of Europe since start of Deng boom, and 20-25% of the land mass is now desert. All the gasoline in China is leaded. A hundred new coal power stations mean that by 2020 its coal consumption will go up by two or three times. Four fifths of coal is not cleaned of crude sulphur before being burned. Factory discharges have killed several rivers, like Jialin River. The result is that a quarter of all Chinese now die from respiratory disease, and lung cancer is rising quickly. The air is sometimes hard to breath, with total particulates rising to 800 micrograms per cubic metre. The WHO recommended limit is under 90, a typical US city has 60. Benxi, in Manchuria, cannot be photographed from the air due to permanent air pollution. Taiyuan, Datong and Xi'an – home of the famous terracotta warriors – are also blotted out by pollution, summer and winter. It is no accident that SARs started in China and expanded so quickly. The official position recognises acid rain as a problem. Behind rhetoric, it has little time for carbon dioxide emissions. (China is major exporter of solar panels, though, and does invest in wind power.) Central government is reluctant to interfere with the emissions from weak state-owed enterprises. Local government is often corruptly involved with companies that emit pollution. Most outsiders think environmental problems and fixing them will cost China 10% of GDP by 2020, maybe more – say 2% off potential GDP growth. It is like debt – they spend environmental capital, then they have to pay back when debt very big. If state does not act, the people are beginning to do so. This is not seen as "environmental" but comes from local scale protests about individual plant. There were two major protests – about planned discharges into fishing grounds, for example – and hundreds or thousands of lesser ones. In general, however, this highlights the helplessness of common people before state and corrupt state officials. No legal system to use, no way of making legal challenge for them. Once again, we come back to the political system. The state capitalism model has led to fast development. Beijing has allowed local government to manage the local economy. It has put in no real controls, over improper behaviour by officials, over bad behaviour by employers or over environmental issues. The result is a system that is really out of control. It has a powerful dynamic that the Party can check only at the most macroeconomic level. Individuals are "droplets in the river", rushed along and thrown about by the system, with no control at all. There are not too many decisions that a working class Chinese can take. However, there is no alternative to this structure. Many people say that China lacks innovation. That's a lie; it's just that the innovation is used almost exclusively to scam others. Go to China, you will see the most innovative fakes in the world and products that look great but fall apart as soon as you bring them home. There is a reason for this; it's because no one there believes they will be in business for long. Short term profit is the only profit. The only "entrepreneurs" that "make it" are state-owned, state-subsidised and shut down anyone that threatens them. Just try to start your own small business, you will find that connections and bribes are everything, and the courts are a joke and the judges are instructed on how to rule (which will always be against you, unless the international media happens to be covering it...). China has rules, regulations, laws, and taxes on the books, but they are only ever used against the little guys; money and power grant exemptions. Good ideas and good products don't get you very far. The real problem in China is that everyone just accepts it. They can't imagine a China without it. Chinese laugh that Richard Nixon resigned after wiretapping his political rivals; in China the leaders obviously tap their enemies, but also their friends! Chinese people laugh at Western politicians getting in trouble for thousands of dollars in fraud or corruptions; in China it's tens of millions or GTFO. Checks and balances? Shared power? Trial by jury? Cross-examination in courts? Ha ha, that just makes nations less efficient! Why would anyone want that? This is the attitude, by educated and uneducated alike. And maybe it's a Confucian thing or an attempt at filial obedience, but the educated class defends the system harder than anyone else. Similar views are repeated many times by many observers. The Party has long abandoned any ideology. It has a purpose, which is to make China "modern" – that is to say, to be powerful and wealthy as a state. Note please, "as a state". Chinese people are a secondary concern, a means to an end. The Party presents modernisation and its problems as inevitable, as part of what has to be. It strives hard from schooling through censorship and state media to prevent people imagining alternatives. It knows, though, that it is only one serious recession away from losing power. A senior figures compared the situation to me with the British in India. Less than a thousand English people controlled three hundred million Indians. Someone is supposed to have said: "If they all spit together, we drown." Spitting may be on its way. State policies around reproduction, health, mobility, the environment, corrupt and budget management, education and welfare – savings and pensions in particular - are being challenged. China has educated huge numbers of people. Modern industry demands fast communications, and people are mixing and comparing experiences, physically and on-line. In spite of censorship, Internet has given ordinary Chinese people a means of shaping public opinion. The entire Muslim West of the country is strongly disaffected with Han Chinese dominance. The Party, too, is showing cracks in its unity. The recent power struggles have been much too public for comfort. The extreme wealth of public officials has attracted public opinion. As we have seen, its power relies chiefly on relies on faith and trust. Chinese society trusts its immediate family, and the overall system, but nothing much in between. The overall system is, though, about to make some major transitions, or if it does not make them, then to set itself a default path that will guarantee a general loss of trust. It is far too simple to talk about China becoming "democratic". There is no democratic reflex in the society. People want an orderly life that does not lean too heavily on them which takes account of their lives. They have accepted huge change and some deprivation in exchange for economic improvements. They want the improvements to continue. Zhang Junmai once wrote that farm community with a distant leadership has few material demands. It can exist over a long period of time with poverty but social balance, scarcity but peace. That ideal still exists in Chinese minds – not poverty and scarcity, of course, but sufficiency, an orderliness, calm under good leadership. That is clear. What is not clear is how to get there. There are then three transitions to make. One is economic, moving from state capitalism based on export-led growth to a different kind of economy. This is fuelled by domestic demand. The activities of the state are increasingly separate from the operation of the economy. The state has the task of funding things the economy will not – infrastructure, certainly, but all the things that lead to orderliness and cleanliness. It does this with taxes, not people's savings or by printing money. Within this, to things have to happen for the 'consumer' economy to develop. First, wages have to rise as a proportion of national income, and either profits or other costs have to fall. Wages in the coastal region grew by 20% last year, and specialists are very hard to find. China is responding through the education system (and migration) but the implication will be a strong cost pressure, which will mix badly with food price and energy inflation. Second, a new kind of industry has to develop that will replace the state enterprises as sources of employment. This will be vigorously resisted by special interests, of which the People's Liberation Army, as shareholders in many such enterprises, will be a force. The second transition has already been discussed. The state has to shift from orchestrating a mad scramble for wealth to become the arbitrator between commerce and the people. It has to clarify its role, and it has to withdraw from inappropriate activities. Indeed, it must oppose vigorously many abuses on behalf of the people. The third transition is related to the second. It is how the state listens, how it disciplines corruption, how it becomes more transparent. The legal system has a major role to play. People and groups need access to binding justice. Most now guess that 100 million people lost land during property boom. These had no legal remedy once local state had given order. They get small compensation, then kicked out to find a new life. State also needs the media to criticise at the local level. They need something that listens at local level, maybe something like local parliament. But that has to balance appointed officials who when they are in office can do really what they like. Not democracy, but listening, probing, getting lines of communication working. Then centre can do its job properly. Today, Beijing can kill a local official for disobeying – they usually call it "corruption", but all are corrupt - but they have given up on anything else. So – is this possible? Well, yes it is if they want to make it happen. But there are two other possibilities. One is they go on like now, and then get into big trouble in ten years. The other, and this is what they are afraid of, is that starting on this goes really bad. China has had many periods when the centre lost control, local powers grabbed what they could and there was a period of chaos. First off, none of our analysts see that as being likely. Also, even though China got very unhappy about the Arab Spring and banned the word 'Jasmine' – for a jasmine revolution - we do not see it likely that popular movements will storms the party offices in Beijing. The PLA is too big and strong fro that, and the population without leadership. We see two things that could go wrong. One really comes from outside – even lower demand for Chinese exports, high commodity prices affecting their inputs and a general sharp slow down. This prevents consumer take-off. It exposes weaknesses, such as the property bubble and local bank over-exposure. Again, no great crash because the state can print money, but with 15%+ inflation and economic growth around 3%. This would have a big impact on the confidence, trust and other intangibles in the society. Then the orderly political transition would be impossible and China would lock down social change. Maybe army come closer to Party in government. It would feel like step into the past. Other possible thing is a result of liberalising too fast, when labour supply is weak. You (Ed.) already talked about this, but now we have had time think about it and it sounds very realistic. Unions are illegal in China, and work force has very limited collective representation. But imagine liberalisation where people talk more freely and information technology opens u for this. And opens up to coordinate social action. So there could then be a sudden, national big burst of labour action, forcing higher wages and better working conditions. Like today owners can just lock the door on a shift and make them work all night if there is a sudden order, and they don't get paid more for this. They just lose job if they object. If they get injured, no compensation, same if they get sick. Ironic maybe that remaining Communist country builds Marx's industrial proletariat? We asked: will China grows as fast as before? Answer is "no". We asked, how will China be led, and where? The answer to that is complicated. We also asked, will China face a big disruption? We think that there could be sudden change, but that there will be no big disruption. So we see three outcomes for China by 2025. In one, it stays on the same course. Its growth falls slowly to a median around 5% There are major scandals, the environment is foul, people are very discontented and the Party clings to power with the help of vigorous repression. In the second, the Party launches itself on the Three Transitions: the separation of state from commerce and the stronger scrutiny of business and local government, the transition to a consumer society, the establishment of routes for ordinary people to some influence and a voice in their affairs. This could be complete in 2025. However, we see much spending on environmental capital, so economic growth is around 8%. The third scenario is the second case, but gone all wrong. We have discussed this in the last section. It is really hard to put meaningful economic numbers on this. Growth would dip lower than 'business as usual' for a while. But as it would force reform, it might bounce back higher. So, a view with some optimism. But a view that says that the easy days are probably over, and that China has to struggle greatly with invisible structures, getting these right at the same time as avoiding falling into the hole where the old structures used to be.